Hyacinth Macaw Personality, Food & Care – Pet Birds by Lafeber Co. The hyacinth macaw stunning cobalt-blue coloring and massive size will cause anyone to pause and take notice. Bright yellow around the eyes and at the base and the corners of the beak makes the largest of the macaw species appear to be in a perpetual smile. This is a parrot for someone who afford a hefty price tag and who has space to spare. The hyacinth macaw’s tongue is black with a yellow stripe running down the side of it. The hyacinth macaw is possibly the most stunning of the macaw family, and is certainly the largest. It is the largest of all parrots. Originally from Brazil, Paraguay and Bolivia, the hyacinth is the “Great Dane” of companion birds, with the mature male reaching over 40 inches in length. Very few people actually have a hyacinth macaw as a companion, and will probably only have the pleasure of seeing one in a zoo or a larger bird shop. Despite its size, penchant for destruction, loudness and expense, this blue macaw is the penultimate companion bird for the person who has the time, patience and wallet to properly keep this beautiful beast. The hyacinth macaw is a stunning cobalt color all over its body, with a ring of bright yellow around its eye and the same color yellow at the base and the corners of its beak. It is often referred to simply as a “blue macaw.” The hyacinth is not twice as large as other large macaws, though its big personality makes other macaws seem like dwarves in its presence. The hyacinth macaw lives primarily in the scrublands at the outskirts of the rainforest, though its large range also includes grasslands and lightly forested regions. It is an endangered species — there are an estimated 2,500 to 5,000 Hyacinth macaws left in the wild today. Destruction of their environment, hunting for feathers and food, and illegal poaching for the pet trade have contributed to the Hyacinth’s declining numbers. Eggs and nestlings have some natural predators as well. The hyacinth macaw is part of many conservation programs: the Species Survival Plan, which helps to ensure the survival of select species, and the World Wildlife Fund-Brazil, which has had their Hyacinth Macaw Project going for 10 years, monitoring hyacinth macaws, setting up artificial nests, and working with local land owners to protect the species, are among them. Another reason why these birds are so rare, both in the wild and in the pet trade, is because they develop much more slowly than companion birds. Babies fledge (leave the nest) at about 13 weeks, but they don’t become fully functioning adults for another six months. Breeding age begins at about 7 years of age. These birds can live to be more than 60 years old if cared for properly. The right owner for a hyacinth macaw is someone who has either kept many birds successfully before, or someone who has done a lot of research, has consulted the experts, and knows exactly what they’re getting into. Still, the Hyacinth is not a great first bird simply because it can be a handful. Hyacinth macaws need a very specific diet. In the wild this bird’s diet consists almost wholly of palm nuts from two specific types of palm tress. Hyacinths harvest the nuts from the trees in the wild, though the bird also has a very characteristic way of finding the nuts already stripped of their tough, fibrous outer coating: Hyacinths forage in cattle lands looking for dung containing the nuts, which are indigestible to the cattle, but easier for the hyacinth to open — the cow has done most of the work. The hyacinth macaw’s diet is very high in fat, and though you may not be able to find palm nuts (especially those predigested by cattle! ), you can substitute Brazil nuts, walnuts, almonds, macadamias, coconut, pistachios and cashews. 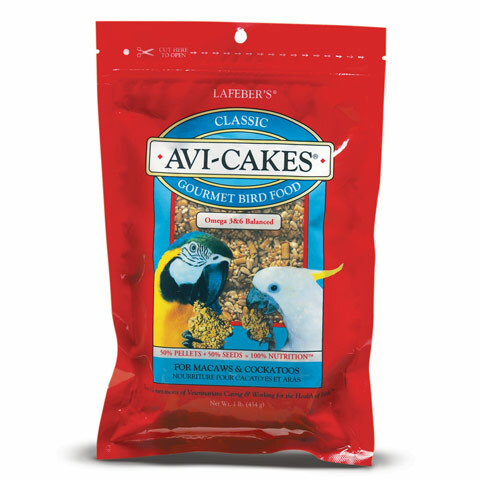 Lafeber macaw foods address these dietary needs. Avi-cakes, Nutri-Berries, Parrot Pellets and more contribute to a healthy diet that also encourage foraging for pet Hyacinths. You will probably never see an obese hyacinth macaw — they seem to metabolize fat very easily and, in fact, need to be encouraged to eat anything else, such as fruits and vegetables, which should be fed daily. Of course, a good seed and pellets based diet can be offered as well. This large bird needs an exceptionally large housing area. Be willing to devote a large part of their home to this bird. A “regular” cage isn’t appropriate in this case. Not only are most commercial cages too small, the hyacinth macaw can easily break out of them. 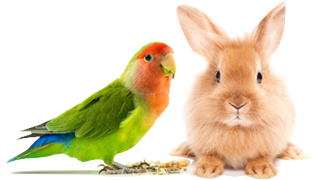 A custom cage or one of the very largest commercial cages would do, though a full room, patio or other safely enclosed, bird-proofed area is better. All birds benefit from flying, and this bird will need a lot of room if it’s going to enjoy this important exercise. Even a hyacinth macaw with trimmed wing feathers needs plenty of room to flap and clamber around. Hyacinths can be very destructive and need lots of wooden toys and branches to chew. A sturdy play gym is a must, though even the sturdiest commercially built play gyms will have a hard time withstanding the hyacinth’s strong beak. Large, safe, replaceable play trees are a good bet, too. This bird, like all parrots, needs a lot of free time daily to play with its humans or just hang out. It is a social bird, usually seen in pairs or in small groups in the wild. They are not “loners,” and will languish without company. Also, confined hyacinth will become cranky and neurotic, and can begin to self-mutilate and scream excessively. They will get along with other birds, particularly New World parrots, but individuals should be introduced early. Often called a “gentle giant” the hyacinth macaw is indeed affectionate, but gentle it is not. Hyacinths subdue very easily, but they tend to want to play rough with other hyacinth macaws, and with their “person.” Its beak carries over 200 pounds of pressure per square inch – that means that it could snap a broomstick in half with one crunch. Even a very tame hyacinth macaw can still be nippy (if you could call that big beak nippy), but that is usually playful behavior. Because its beak is so intimidating, this bird is best kept by a person who is not daunted by the thought of being bitten — there’s no guarantee, even with the tamest bird, that the occasional bite will not happen. If you have close neighbors, you may want to reconsider getting a hyacinth macaw. This bird is extremely loud and prone to screeching. One hyacinth might not be so annoying to neighbors, but a pair will pump up the volume. Also, a loud hyacinth macaw can call the attention of bird-nappers looking to sell such an expensive bird, so make sure to keep your birds safe from potential theft. Hyacinth macaws are not the best talkers among the macaws, but they will learn a few favorite words and phrases and repeat them over and over. These birds are highly intelligent, and may learn to contextualize certain words as well. Hyacinth macaws are especially prone to overgrown beaks and need a steady supply of safe items to chew. As with other macaw species, hyacinth macaws are susceptible to proventricular dilatation disease (“Macaw Wasting Disease”), psittacosis and papillomas. A diet catering to a hyacinth macaw’s special needs as well as regular health exams is key to maintaining good health. Hyacinth macaws are not often found in full service pet shops because they are quite expensive — retail buyers should expect to pay upwards of $10,000 for a young hyacinth, perhaps more for a mature, ready-to-breed adult. Pairs bring top dollar, especially if they are “proven,” having bred successfully before. Because these birds are so rare, many of them are in breeding programs, rather than being bred by novices. Many breeders hope eventually to reintroduce this species into the wild, where their numbers are rapidly declining. It is almost not fair to the species to see them in “pet-only” homes, when there is a real danger that this beautiful giant may disappear forever.